Dragon’s Deviled Eggs is one in a series of recipes created by Andrea Correale, founder and president of Elegant Affairs. These recipes are designed to take your “Game of Thrones” final season watch party all the way to the Iron Throne. Find cocktails and other appetizer recipes here. 1 Using a large pot, submerge eggs in water. Make sure water covers eggs. Add food coloring to obtain a black color. Bring eggs to a boil and remove from heat. 2 Cover and rest for 10 minutes. Remove eggs but keep water in the pot. 3 Lightly crack each egg on ONE side of each egg. Transfer eggs back into pot with colored water. Allow eggs to rest in water until completely cool. 4 Once cool, peel and discard shells. The webs will appear on eggs. 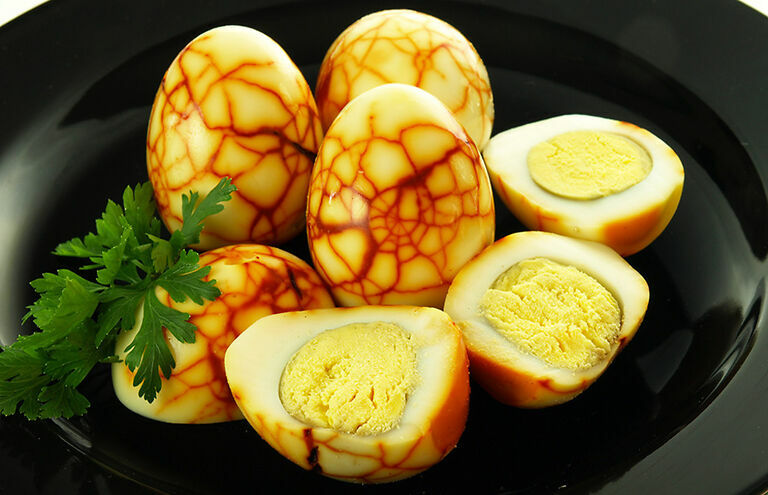 5 Cut each egg in half, top with salt and pepper (or topping of your choice).